According to a recent study by the Harvard Business Review. as well as a 2009 report in TREND Magazine, a consumer “crisis of trust” currently exists, extending to both government and business. This crisis is evident throughout the world but to a higher degree in this country. Just watch the news to see the ample evidence of this growing trend among the American people. Real estate has long been a relationship business – basically it is a baby-boomer model – and as a result of this change in consumer confidence, the industry will no longer be able to thrive and prosper the way it has up to now. In other words, the relationship will no longer be able to stand alone as a way to secure business; going forward, it will be based on a combination of the relationship and verifiable skills-with the emphasis on verifiable. The way we are measured has changed. The numbers are still numbers, of course – but the difference is the ones that matter to the people that matter – the consumer who hires us – and the agents who consider working for us. A full understanding of this fact has to penetrate management mindset and objectives. For today’s skeptical consumer it’s no longer market share. No longer a claim to being “No. 1”. No longer being the largest or oldest company in the area. In the eyes of the consumer these numbers can all be easily manipulated and often times are. In fact, these new “measures” allow large and small companies to compete on a level playing field – these measurements speak volumes about our ability to get the job done. 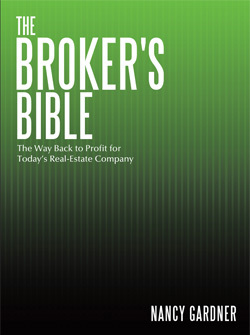 The Broker’s Bible is a workbook designed to help you look at every area of your business in a new light based on today’s market and give you the tools you need to get back to profitability. i want to be profitable – buy now!